NEW FlowTubes are ideal for fluorescence activated cell sorting (FACS) and related applications. 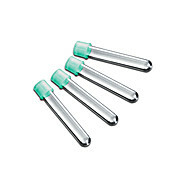 These tubes are primarily used to collect dissociated samples for subsequent processing in automated flow cytometry instruments. Made of crystal clear polystyrene, these specialized tubes are manufactured to precise tolerances, making them compatible with multiple FACS instruments. FlowTubes’ strict dimensional specifications ensure complete compatibility and a perfect seal with gaskets/o-rings on FACS nozzles.